New Year, New You Christmas Upgrade! We want to know what the WORST Christmas present was that you received this year! Post a picture of it to our Facebook, Instagram or Twitter and use #BluegrassSaveMe and tell us what you would buy if we upgrade that awful present to a $250 gift card to the Outlet Shoppes of the Bluegrass! Details: Contest runs December 28th – January 3rd. 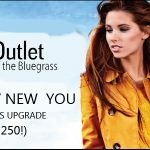 Visit www.theoutletshoppesofthebluegrass.com for more information!